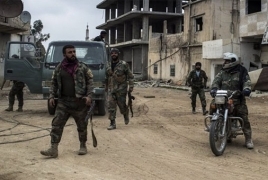 PanARMENIAN.Net - The Syrian Arab Army unleashed a powerful assault inside the northern countryside of the Hama province tonight, a military source said, Al-Masdar News reports. According to the military source, Syrian Arab Army fired a plethora of missiles and artillery shells towards the militants in the northern countryside of the Hama province. The attack by the Syrian military comes just shortly after the militants fired several muscles towards the Syrian government stronghold of Mhardeh.